Cap up to 10 cm, initially hemispherical, later convex to flat-convex, red, dark red, brownish red, pinkish red, sometimes discolouring to pale brown, usually dry, velvety, sometimes cracking. Stipe more or less cylindrical, often curved, bright yellow, but dark red in the base. 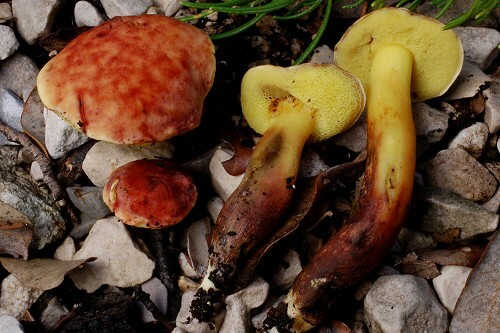 Flesh yellow, beetroot red or reddish brown in the stipe base, mostly unchanging in the cap and slightly blueing in the stipe. Tubes yellow to olivaceous yellow, usually blueing when injured. Pores concolorous with the tubes, blueing when bruised. Smell not distinctive. Taste not distinctive. 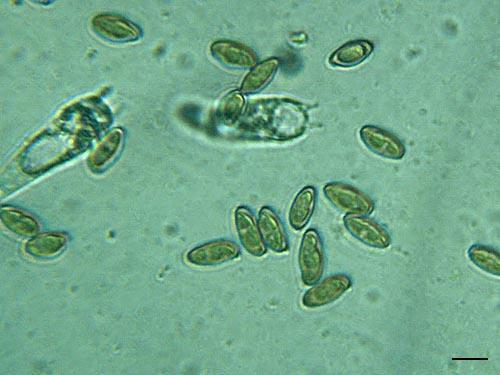 Spores 11–17 × 5–7 μm, smooth. Pileipellis a trichoderm of slender septate hyphae of long cylindrical incrusted cells. Habitat. Warm broadleaf forests on calcareous soils, mycorrhizal with oaks (Quercus). Distribution. So far known only from the Mediterranean area (Europe – Croatia, Greece, Italy, Spain). Possibly more widespread as it has been spotted recently also in the Near East (Israel). Similarity. 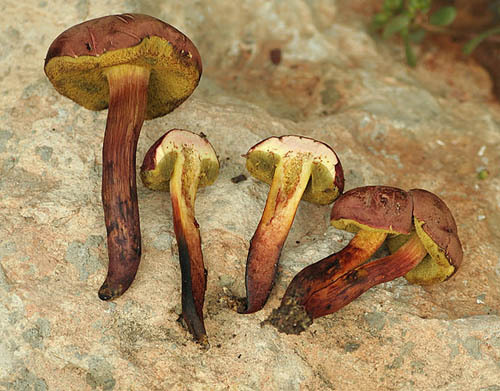 Similar to most of the reddish coloured boletes around Xerocomus rubellus and Xerocomus chrysenteron. Macroscopically distinguished on the account of the peculiar beetroot red colour of the flesh in the stipe base. Microscopically it is distinguished by its wide, smooth, non truncate spores and the cap cuticle composed of slender incrusted hyphae. Note. It has become known recently that the European fungus is different from the American Xerocomus dryophilus (see Hills 2009). Consequently, new name will have to be assigned to the European species. There is a preliminary name given, Xerocomus guidonis, but it is not yet formally published. Polemis, E., Dimou, D.M., Tzanoudakis, D. & Zervakis, G.I. 2012. Diversity of Basidiomycota (subclass Agaricomycetidae) in the island of Andros (Cyclades, Greece). – Nova Hedwigia 95: 25–58.